With Halloween, one of my favorite holidays, just around the corner, let’s have a chat about all things witches. If you’re someone like me who looks at the books, TV, and movies in a “big picture” kinda way, then you’ve probably already predicted the next BIG trend. And, yes, it’s most definitely witches. On the small screen, we’re seeing reboots of classics like Sabrina the Teenage Witch and Charmed. Not to mention the recently announced reboot of Buffy the Vampire Slayer which we all know has the beloved character Willow! I’ll be eagerly watching to see how they portray such an iconic character. Then, new shows like A Discovery of Witches, based on the Bestselling books by Deborah Harkness. In movies, we’re seeing all kinds of witchy related goodness! Just peruse the Netflix library to see for yourself. But I’m most excited for the announcement of The Craft remake. There’s so much good stuff out there to watch if you’re a love of the Paranormal and Fantasy genres, especially with a witchy theme. But did you know that most ideas come from books? That’s right. All the really good stuff starts with a good witchy read. A popular series. A Bestseller. So, be sure to scoop up any new books about witches because it just might be the next big thing to reach the screen! How Do I Fit in to This? My author bestie, JJ King, and I spent all year writing a Time Travel Fantasy Romance about a powerful Celtic Witch Princess who tries to escape an arranged marriage to a Scottish Sorcerer. Ashlynn attempts an ancient spell and accidentally throws herself to the future where she lands in the hands of a handsome Romani prince and powerful sorcerer named Cian. It’s called Reigning Magicks and will be found exclusively in the upcoming Rite to Reign collection in December! We’re both so excited to be joining 25 other amazing authors in this awesome project! Preorder your 25 books right now and reserve the special $0.99 price! Click here! Rite to Reign is a collection of 25 Paranormal Romance and Urban Fantasy stories and has been my passion project this year. Partnering with my author bestie, JJ Jing, we sat down and created one of our best stories to date! I’m serious, guys. Reigning Magicks is our contribution to the collection and it follows the story of a powerful Celtic princess and heir to the clan Kavanaugh kingdom. When she seeks a way out of an arranged marriage, she accidently throws herself to present day and in the hands of a handsome Gypsy prince named Cian. Wanna Read a Snippet from Our Story? “It’s for the good of the people, darling,” Aoife insisted, her expression remaining staid. PREORDER YOUR COPY OF RITE TO REIGN HERE! Reigning Magicks is just ONE of the 25 amazing books found inside this wickedly good anthology. And 25 full length books for just a dollar is a steal of a deal! Be sure to pre-order yours today and be the first to read when it comes out in December! The Rite to Reign authors have put together a cornucopia of goodies for you! Read on to find your freebies, join the hunt, and party with us! The Rite to Reign Scavenger Hunt has a new author, blog, and prize EVERY SINGLE DAY in October! Click here to find all the goodies! The Rite to reign party room has been hoppin’ for weeks now! We’ve got games and prizes daily, PLUS a huge prize for every member threshold met. We’re so close to the next threshold with a prize of a signed paperback combo! The final prize will be an Amazon Echo! Join here! The authors of Rite to Reign have put together this awesome FREE gift for readers who have graciously pre-ordered the anthology! The Book of Spells is packed full of witchy goodness and is totally FREE! If you’ve pre-ordered your $0.99 copy of Rite Reign then scoop up your gift right here! And that’s about it, folks! Like I mentioned earlier, Rite to Reign is a passion project and I embarked on this amazing journey in hopes of hitting the USA TODAY list. In fact, that the goal of all 25 authors in the set. EVERY share counts. EVERY pre-order is one step toward reaching that dream. If you love Paranormal Romance, Urban Fantasy, and wicked good deals, then PLEASE pre-order Rite to Reign for just $0.99! 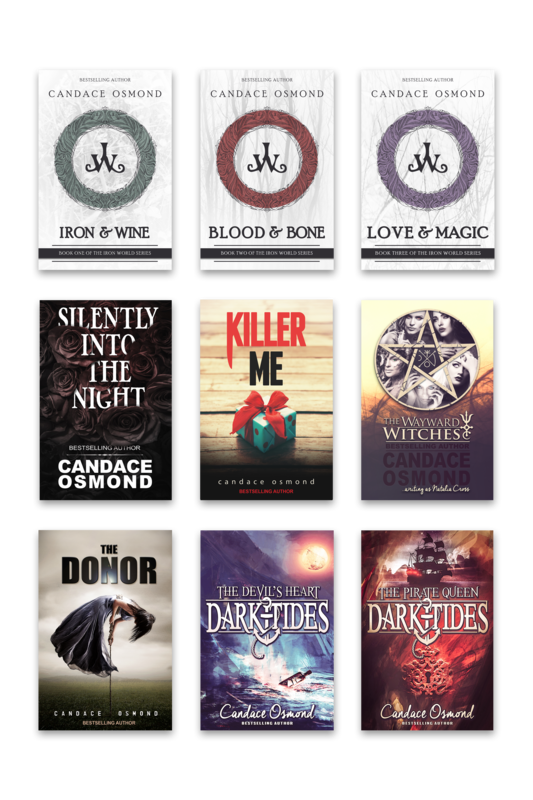 Just be sure to take advantage of all the amazing goodies we’ve whipped up for readers, too! Author of Paranormal Romance, Sci-Fi Romance, and Thriller.